Lakewood Auto Body is a family run, locally owned and operated auto body paint and repair shop serving Fircrest, WA since 1962. Apart from custom auto painting, we offer complete body repair, scratch repair and comprehensive mechanical repairs. Our specialty lies in car painting Ram vehicles. Along with professional expertise, unmatched customer care and support is a feature that has made us the leading car and truck painting Fircrest specialist. We welcome our customers with a cozy waiting room where they can relax with HDTV and free snacks while we make an estimate of the services required on their vehicle. This is followed by timely, professional, and no hassle services. The paint jobs get a complimentary auto detailing. 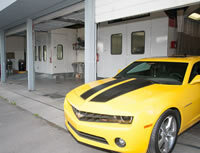 All our auto body paint and repair jobs carry lifetime warranty. Such unmatched professionalism makes us the ideal choice for truck painting Ram in Fircrest, WA. The paint and enamel of your vehicle takes quite long to get hardened or cured completely. Though it may look quite fine to you, it is not actually strong or hard enough to withstand rubbing, buffing or waxing for as long as 3 months after getting the vehicle painted. Make sure that you do not wax or buff your Ram car/truck for at least 90 days after going in for body paint. The precaution will reward you with a bright and shiny Ram for years to come. In Fircrest, WA, you should come to Lakewood Auto Body for the region’s finest truck painting Ram 3500. Searching for effective, durable and cost-effective car painting Ram Cargo Van in Fircrest, WA? Lakewood Auto Shop is the ideal paint shop for you. ASE and I-Car certified paint technicians. Friendly, courteous and cooperative staff. Skillful, trained and experienced technicians. >Use of top quality paints and industrial finishes. Use of computerized paint matching systems to ensure restoration of vehicle to original look.